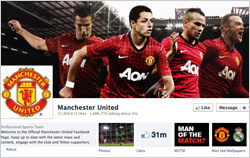 An undisclosed marketer has signed an eight-year deal to place its brand on the practice gear for Manchester United, one of the world’s most valued sports franchises. Seeking a step-up in payment, the team recently bought out the final two years of its deal with DHL, which was worth a reported $62 million over four years. Chevrolet has a separate deal to replace Aon on the front of jerseys used in games. Manchester United has also recently taken full control of its MUTV network, buying out BSkyB’s one-third stake in a deal worth $15.5 million. The network, available in nearly 60 countries, was launched in 2008 with two partners; the team has bought out both. Related to the BSkyB deal, the MU plans to launch a new digital product this year. It has also concluded several additional sponsorship deals -- including two in China -- that the company said should help it increase its direct-marketing database, which has grown to 25 million, allowing direct contact with supporters around the world. In the most recent quarter, the team said it posted revenue of $170.7 million, while adjusted EBITDA -- the metric the company uses to gauge ongoing operations -- came in at about $78 million. Revenue was up from $157 million, while adjusted EBITDA increased from about $70 million. Manchester United leads the English Premier League this season. The team could benefit financially from new rules in the league that will curtail the level that teams can raise their salary rolls to.